September | 2013 | ReadWriteLib Reads! This book made its home on my bookcase back in middle school, when I decided that I needed to read something else by C.S. Lewis, having loved The chronicles of Narnia series. 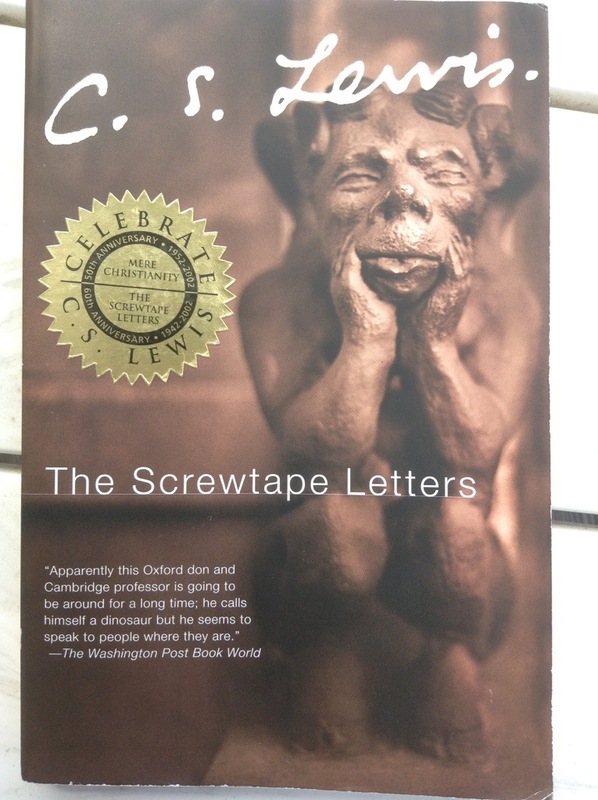 The Screwtape letters seemed the best pick then, yet the format of storytelling in one-sided letters along with the philosophical religious content written in a didactic tone overwhelmed me at that young age. And it still threatened to as I read it now. Screwtape is a high-ranking demon for the Devil who writes these letters to his young demon nephew in hopes of guiding him into successfully capturing his human patient’s soul. Wormwood, the nephew, struggles with corrupting his patient and in the end loses the battle when his human dies in the WWII bombing of England, having found God and solidified his belief in the months prior. Screwtape’s letters to Wormwood are the entirety of this book and with each letter, it is clear that his guidance isn’t being heeded as the patient’s soul slips further from their grasp. Beyond the format and the set-up, the real charm and creativity comes from the content itself. Screwtape’s demonic guidance to Wormwood focuses on distracting his patient from godly thoughts and actions by any means. His advice includes: making the patient self-involved, exaggerating mild annoyances of others, tempting the patient’s physical self, keeping a division between his religious tendencies and his everyday life, and finally ensuring he lives through the war to a more corruptible old age. However, listing some of Screwtape’s advice makes it sound basic and straight-forward but the letters are anything but. If such a feeling [of Christianity] is allowed to live, but not allowed to become irresistible and flower into real repentance, it has one in valuable tendency. It increases the patient’s reluctance to think about the Enemy. All humans at nearly all times have some such reluctance; but when thinking about Him involves facing and intensifying a whole bag cloud of half-conscious guilt, this reluctance is increased tenfold. They hate every idea that suggests Him, just as men in financial embarrassment hate the very sight of a pass-book. In this state your patient will not omit, but will increasingly dislike, his religious duties. He will think about them as little as he feels he decently can beforehand, and forget them as soon as possible when they are over. A few weeks ago you had to tempt him to unreality and inattention to his prayers: but now you will be able to find him opening his arms to you and almost begging you to distract his purpose and benumb his heart. He will want his prayers to be unreal, for he will dread nothing so much as effective contract with the Enemy. Lewis uses this style of philosophical religious argument and persuasion in all of Screwtape’s letters to Wormwood, as a wise advisor would to a newcomer. There is elegance and logic to the advice in the well-crafted letters that makes them both a joy and challenge to read. It’s no surprise that Lewis knows Christianity and counter-point arguments and actions very well; it’s clear that this is a topic of immense contemplation. Many people could write letters between two demons trying to win a man’s soul for the Devil but only Lewis could write it as sophisticated and complex as the Screwtape letters. Recommended? : For anyone into fundamental, religious inquiry and reasoning. Christians and non-Christians would appreciate this work due to its unique and interesting content and format. The book reads like essays more so than a novel but there is a plot line though the letters address the ramifications of Wormwood and his patient’s actions. It’s a fascinating read but highly intellectual and a different sort of read. This book is a great combination of Lewis’ skill as a fiction writer and thoughtfulness as a curious, studious Christian pondering profound questions. Frank Herbert’s Dune ranks among the most beloved science fiction classics. With its inventive world of Dune (a.k.a. Arrakis), the native people there, and the creative plot line, it is easy to see why. Fandom is huge, with wikis, movies and mini-series, and many more Dune books in the series that is continued on by his son Brian Herbert and other writers. However, I did not enjoy this novel as much as some other sci-fi works–please don’t tell my uncle. The story never gripped me the way others sci-fi stories have, the characters held themselves at a distance rather than invoking my love and concern for them, and the world remained a backdrop instead of a complex, envisioned universe. The novel contains all of these great elements and had the potential but Herbert didn’t give it that extra push to make it come alive in a magical way for me. Everything felt scripted and wooden, lacking charm the way typical sci-fi captures the imagination. Arrakis sands are full of spices, which make life on the planet impossible without a stillsuit to retain and maintain water levels in the body when outside. The environment and the technology making it possible to live there are touched on but are not the central focus. The plot jumps around frequently with quotes from various writings from the future as header breaks. These quotes made the world more comprehensive yet could not redeem the plot line that waned my interest more so than piqued it. Emphasis on technology and the vast differences between the created story world and real life are what separate sci-fi from fantasy, which focuses on the envisioned world with nature and usually magical or paranormal elements, in my opinion. Dune sat in the gray area as not a true work of either with a plot that meandered slowly with rare spikes of action and intrigue instead of an ever-growing tension that culminates into a climax and resolution or a solid ending that sets up another book to come. The books was predictable and I feel snobby saying that but the way in which people acted and the neat and tidy resolutions and outcomes are a testament to its predictability. Messiness, chaos, and strife rule sci-fi works for a reason–there is need to fight back or live a counter-culture life to take a stand for values and morals since lost in the highly controlled or technologically advanced sci-fi worlds that are typical of the genre. This novel lacked this important aspect. To play my own devil’s advocate for Herbert fans reading this and screaming at my review of just how wrong I am, Herbert did create a new concept and world that are spectacularly unique with races that are distinct in odd and interesting ways along with inventive technology. His appendixes are also included, at least in the 25th Ace edition from 1990 of mine, to further the lore and history of Arrakis. But at the end of the day, his intent was to write a sci-fi novel and I stand by my review above, even though I’ll never argue the view to my uncle since he adores this novel. 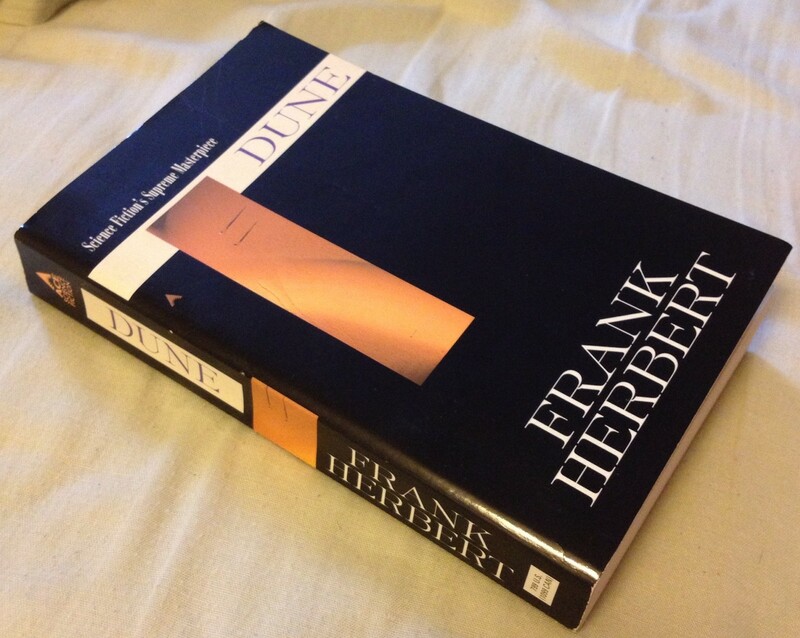 Despite the fact that it is part of a series, I am also a firm believer that each and every book in a series needs to be complete in and of itself, able to stand alone as well as fit into the larger series and world, which I don’t believe Dune fully does. Recommended? : For die-hard science fiction fans who especially love the classics in this genre. I’m glad to have finally read it to now know Herbert and his work. There’s nothing scandalous or gruesome in the book so it’s a great novel for younger readers who enjoy sci-fi, especially boys. The main character is a 15, then part way through 18, year old young man tasked with growing up too soon and leading his people during tough times.